How to fix “Your Outlook account settings are out of date” error on Windows 10? Home »	Fix » How to fix “Your Outlook account settings are out of date” error on Windows 10? Issue: How to fix “Your Outlook account settings are out of date” error on Windows 10? Hello, all. Right after the upgrade to Windows 10, my mail stopped working. Simply as that. When I try to open it, I get the error message “Your Outlook account settings are out of date”, which provides two options – either “Fix account” or “Dismiss.” I tried to click “Fix account,” but the message starts flashing and eventually disappears. No other windows open. Has anyone encountered the same problem and could help me? This fix apply for those users who are using Local Account on Windows 10. If you are already signed with the Microsoft Account, then please skip this method. Press Windows key + I and open Accounts. Select Sign in with a Microsoft account and enter the password if required. Press Next and enter login information. Press Next and re-enter the login information if required. Press Next again and select the account verification method. Now press Next and wait for the confirmation code. Make sure everything is correct and click Switch button. Finally, log out of the Local account and sign in with the Microsoft account. This fix apply for those users who are using Microsoft Account to log into Windows 10. If you are already signed with the Local Account, then please skip this method. Press Windows key + I and select Accounts. Click on Sign in with a local account instead and enter the account password. Click Next and enter the name of your local account’s username. Press Next and click Sign Out. Finally, sign into Windows using your local account and check if the “Your Outlook account settings are out of date” error has been resolved. Launch the Mail app and open Settings. Select Manage accounts and select you Outlook account. Now open Settings and select Manage account again. Select Add account and scroll down until you see Advanced setup. Click on Internet email option and enter the required information. Select IMAP4 as the Account type and click Sign in. Select Date and Time and open Internet Time tab. Click on Change Settings and unmark the Synchronize with an Internet time server check box. 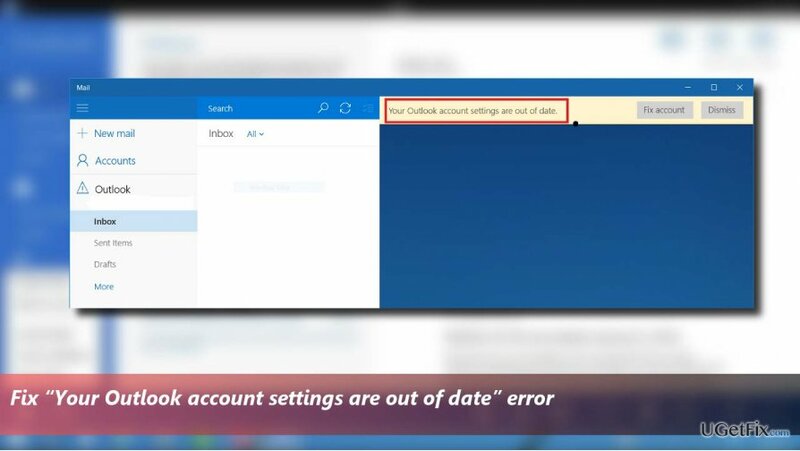 Hopefully, this guide helped you to fix “Your Outlook account settings are out of date” error. If, after all, you are still encountering the problem, please inform us, so that we would further analyze the problem.